"Come O people of the world! Let us walk the path of truth. The path of truth is the path of peace. The path of truth is the path of happiness." In one of the worst maximum security prisons in the United States, an unprecedented event occurred. 36 prisoners participated in a Vipassana retreat--10 hours of meditation each day for 10 days--and found a kind of freedom they had never known before. Donaldson Correctional Facility in Alabama is, according to one of its administrators, a "breeding ground for violence." And for the prisoners within, "Life without parole...means you're to be warehoused 'til you die." But when Dr. Ron Cavanaugh, Director of Treatment at the facility, stumbled across an article about the positive outcome of meditation on inmates in India, he thought the calming effects of meditation might be beneficial for the inmates at Donaldson. The prisoners took to meditation quite naturally and became a growing network of men gathering to meditate on a regular basis. This phenomenon caught the attention of psychotherapist and social anthropologist Jenny Phillips, whose interviews with the prisoners inspired her to bring the intense practice of Vipassana to Donaldson. The Dhamma Brothers, co-produced and co-directed by Phillips, documents the highly unorthodox program and how it profoundly changed many of its participants. In a monastic setting that Vipassana teacher Bruce calls "a prison within a prison," the men undergo a regimen that is stricter than their normal daily prison schedule. One inmate remarked that, "I spent eight and a half years on death row and this was harder." Against a backdrop of the Bible-belt, where one resident exclaims, "I don't believe in Buddhism...or witchcraft," it's astonishing that this program was ever allowed to be instituted. One prisoner remembers a fellow inmate voicing concern that others will turn Buddhist, because they won't understand. "What's not to understand about compassion, love and caring?" he replied. Unfortunately, despite the obvious positive effects of the program, that narrow mindset won out as the prison Chaplain called the Commissioner directly to complain that his parishioners were becoming Buddhists. The program was shut down later that year, but with a change in administration, warden and chaplain, Dr. Cavanaugh again seized the opportunity in 2006 to have Jonathan and Bruce from the Vipassana Academy return to conduct sessions once again. Upon seeing the line of former students awaiting their return Bruce remarked, "Jonathan and I have the dubious distinction as the only guys who want to come BACK to Donaldson. All you guys want to get OUT!" The word "vipassana" means "to see things as they are" and the inmates who have undertaken the challenging program find not only a coping mechanism to calm and control their emotions, but faced their fears and accepted responsibility for the actions that brought them to where they are today. The film is not merely a documentary about this unusual program, but raises questions and issues regarding our incarceration system. Said Bryan Stevenson, Executive Director of the Equal Justice Initiative, "Every person is more than the worse thing they have ever done." Or in the words of one of the "Dhamma Brothers," Rick Smith, ""I thought my biggest fear was growing old and dying in prison. In truth my biggest fear was growing old and not knowing myself." 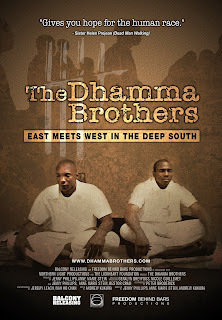 It is the plan of the producers to make The Dhamma Brothers available to those most directly affected by the problems endemic in American prisons--prison inmates. They will be the direct beneficiaries of this inspiring message of the potential for change behind prison walls. The Dhamma Brothers also opens in NYC on April 11th at the Cinema Village.